My world is on fire. The wildfires grew faster than my sense of reality could keep up. We'd had heavy wind all day on Sunday, and as I went to bed it grew to monstrous speeds. So I wasn't alarmed when I woke in the night to the strong smell of smoke. We'd had weeks of smoke from distant fires back in August. While a sane person would have been ready to call the fire department and evacuate the house, I just chugged water to sooth my raspy throat and went back to sleep. It wasn't until morning that I discovered it was a problem. My local Facebook group was all over the news of wildfires in the region, threatening places we actually go. Monday is grocery day, but I didn't go because the road I take was closed, and I didn't want to crowd the detour with all the displaced traffic. K's school sent a message that they still had power and would be open--my first hint that the power was out beyond the college property on which we live. She went to school, but within an hour, they sent us a message that, due to the lack of internet and cell network, we were free to pick up our kids if we wanted to. I took the twins and got her, not because I didn't feel safe, but because I like her home. College classes went on, but J got messages from students who couldn't come in. In all, about a third of his students never made it to class. It was getting smokey again as evening arrived. Tuesday was a crazy mix of boredom and alarm. The little airport just behind us was now home base for CalFire. We listened to helicopters landing and taking off all through the day. Facebook started spitting out testimonials--stories and pictures, aerial views of the remnants of neighborhoods, buildings flaming red against the black sky. The college market promised generators and other emergency supplies were on the way, but the gas station was out of regular fuel. People wore dust-type masks on campus to filter the air. Meanwhile, I kept the kids inside because of the smoke, and struggled to keep them entertained. There is a kind of barrier in our minds, I think, between normal life and real serious threat. We live day to day with the assurance that we will be fine. There's no particular reason we think that, except that we are fine at the moment. The danger has to reach a certain threshold before it breaks through the wall and, as they say, "the (stuff) gets real." I've been in danger plenty of times. I can count on one hand the times my mortality became a living thing in front of my face. I'm not sure exactly what pushed it over. It might have been the weight of the photographs--most haunting was an Adventist academy I hadn't even known about until it was gone. The fire wasn't even two days old. How could something so sudden be so permanent? But probably it was when the college sent word that it was cancelling classes for the rest of the week, so students could leave. The fires had threatened the two closest towns--one was evacuating. Now there was a chance of losing our escape routes if certain roads closed. And now it was about me and my family, too. The winds were set to pick up again that night. We went to bed not knowing what would happen, and woke to hurriedly check Facebook. The smoke smell was thick again, even in the house. We decided to leave. It wasn't really evacuating. Sort of pre-emptive evacuation, and sort of taking a 5-day weekend. We decided over breakfast, and managed to drive out about 9am. The kids gathered their clothes, and put toys in their backpacks, and I loaded up snacks for the car ride. And then I got to the hard part. What else should I take? I had the laptop and the phone charger. I pulled the files that had our documents for the car and our house, and the kids' birth certificates. I packed up the cat, his food, and a makeshift travel litterbox. Then I stood alone in my bedroom, and looked at my things, and tried to decide to bring anything else. My stuff. I waited a long time for it. We'd moved in early August (so most of it had been packed in July), and a moving truck had finally delivered it at the end of September. I remember my relief at seeing it--real couches to sit on, small appliances for cooking (I missed smoothies), other clothes. Real plates, and kids' books, and yarn to knit. (And this is where I thought maybe we shouldn't have had it moved yet, since it could all burn up.) It had seemed like a treasure trove at the time. I stood and looked at it, and thought of all the free space in the minivan. What should I bring? My best yarn? My collection of costumes? (too big to fit) A favorite decoration? The scrapbooks were all still in boxes in another building. Try as I might, I couldn't think of anything. It would either be here when we got back, or not. I took one book, and my current knitting project. Fire is revealing. 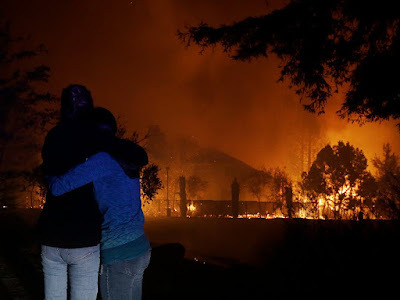 The wildfires didn't burn my home, and although they're still there, they're getting contained. But their presence in my world is instructive. When my sense of reality caught up with the burn paths, when the barrier in my mind finally gave way, things didn't look the same. The scope of value changed. I have things of value--clothes I like, costumes I've made, expensive yarn. But instead I packed extra food for a cat with bad manners, one who was not going to make the trip better. (And, who was more likely to survive the fire than my stuff, since he has legs.) I walked past my wedding dishes and small appliances, and packed the kids snacks. And I didn't do it because I'm so unmaterialistic. Trust me, I love my stuff. It's just that some things are important and some aren't. The local Facebook community had no trouble with the idea. They advertised space in their homes for those who needed to evacuate. They volunteered clothes from their closets, or food from their gardens. They watched each other's homes, and looked after neighbor's pets. My favorite story was the one about the English department's adopted gray feral kitten, dubbed "Gandolf the Stray." Someone advertised looking for a humane trap to catch him, so he wouldn't have to be left behind. We got treated that night to a pic of his blue-eyed cuteness cowering in a corner, indignant but safe. Four days later, his rescuer posted a video showing a much happier cat, curled in a cardboard bed, graciously allowing a human to pet him. So all that stuff the forestry people tell us is true--fires can do good things for us, as well as destroy. I don't want to speak lightly--thousands of people are suffering now because of the devastation. People have died. The spiritual carnage of loss is just as real as the charred homes. But we can do something about it. We can take care of each other, if we remember what's important. We're back home now. Classes have started again at the college, and I've finally made my grocery trip. Life could go back to normal. And I could forget. The barrier in my mind is easy to rebuild. But I have to fight to remember. I need to remember how it feels to look at my life in the light of the wildfires. I need to remember what's important. Whether we notice or not, we are all living in a world on fire. God calls us to notice and serve our neighbors. When it comes down to it, we all know there is nothing in life worth protecting as much as the lives around you. We know, when we remember. "But the day of the Lord will come like a thief. The heavens will disappear with a roar; the elements will be destroyed by fire, and the earth and everything in it will be laid bare. That day will bring about the destruction of the heavens by fire, and the elements will melt in the heat. But in keeping with his promise we are looking forward to a new heaven and a new earth, where righteousness dwells." I can identify with you say about that barrier and the ability to forget aspects of such experiences. For the first time in my adult life we were face with the possibility of destruction by hurricane Ophelia and it just didn't feel real. I felt cacooned in my home and didn't take the chance to go buy supplys in case the electricity went out etc...It was surreal and then I heard from friends who affected negativly ...and 3 people died. Once in a while it's not a bad thing to look hard at our own mortality. It happens when someone we love dies. It happens when a wildfire passes us by. One discovers what one really believes in that circumstance. It certainly gives you pause and makes you realize how precious every second of life is.